Dr. Auñón-Chancellor came to Johnson Space Center in August 2006, employed as a Flight Surgeon under the UTMB/Wyle Bioastronautics contract. 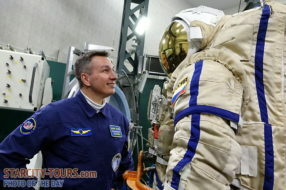 She spent more than nine months in Russia supporting medical operations for International Space Station crew members in Star City, including water survival training in the Ukraine. Dr. Auñón-Chancellor served as the Deputy Crew Surgeon for STS-127. She also held the role of Deputy Lead for Orion — Medical Operations. Graduated from Poudre High School, Fort Collins, Colorado in 1993. Received a Bachelor of Science in Electrical Engineering from The George Washington University, Washington, D.C., in 1997 and a Doctorate of Medicine from The University of Texas — Health Science Center at Houston in 2001. Completed a three-year residency in internal medicine at The University of Texas Medical Branch (UTMB) in Galveston, Texas, in 2004, and then completed an additional year as Chief Resident in the Internal Medicine Department in 2005. She also completed an aerospace medicine residency at UTMB as well as a Master of Public Health in 2007. She is board certified in Internal and Aerospace Medicine. Dr. Auñón-Chancellor came to Johnson Space Center in August 2006, employed as a Flight Surgeon under the UTMB/Wyle Bioastronautics contract. She spent more than nine months in Russia supporting medical operations for International Space Station crew members in Star City, including water survival training in the Ukraine. Dr. Auñón-Chancellor served as the Deputy Crew Surgeon for STS-127. She also held the role of Deputy Lead for Orion — Medical Operations. Dr. Auñón-Chancellor was selected in July 2009 as one of 14 members of the 20th NASA astronaut class. She graduated in November 2011 from Astronaut Candidate Training, which included scientific and technical briefings, intensive instruction in space station systems, spacewalks, robotics, physiological training, T-38 flight training and water and wilderness survival training. She spent 2 months in Antarctica from 2010 to 2011 searching for meteorites as part of the ANSMET expedition. Most of that time was spent living on the ice 200 nautical miles from the South Pole. In June 2012, Dr. Auñón-Chancellor operated the Deep Worker submersible as part of the NEEMO 16 mission. She subsequently served as an Aquanaut aboard the Aquarius underwater laboratory during the NEEMO 20 undersea exploration mission. Currently, Dr. Auñón-Chancellor spends most of her time handling medical issues for both the International Space Station Operations branch and Commercial Crew Branch. She is also certified as an International Space Station CAPCOM and served as the lead Capcom for the SpaceX-4 and SpaceX-8 cargo resupply missions. Since January 2018 Serena has been training as the ISS-56/57 prime crew member. Thomas N. and Gleaves James Award for Excellent Performance by a Third-Year Resident in Internal Medicine (2004).